Questions? Call 856-368-9085 Inspired by island living, Antigua brings enchanting details to office enviroments with an expanded line-up to furnish any office requirement. 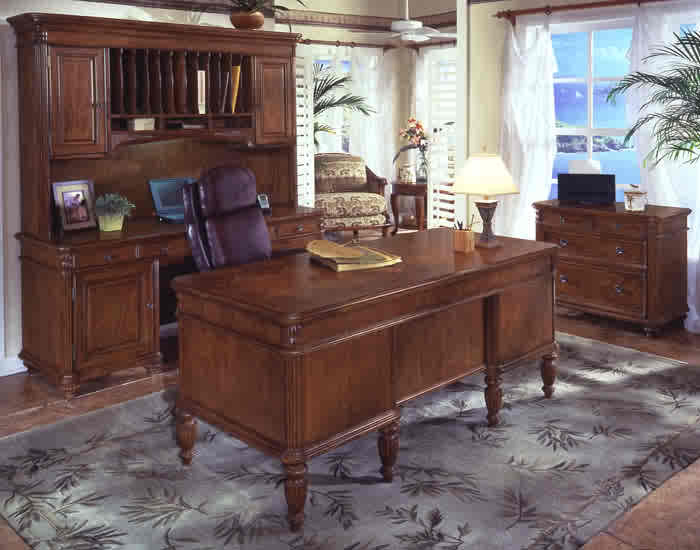 Lightly carved and featuring a West Indies Cherry Finish, Antigua showcases casual style with refined elegance. 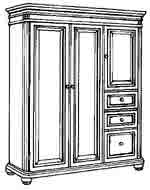 Computer Armoire boasts a full office behind raised panel doors. 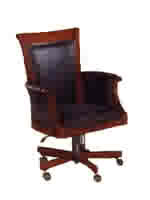 Choose from Executive Desks, L and U Units. Computer L Desk includes CPU cabinet. Cable-ready Computer Credenza includes printer cabinet. 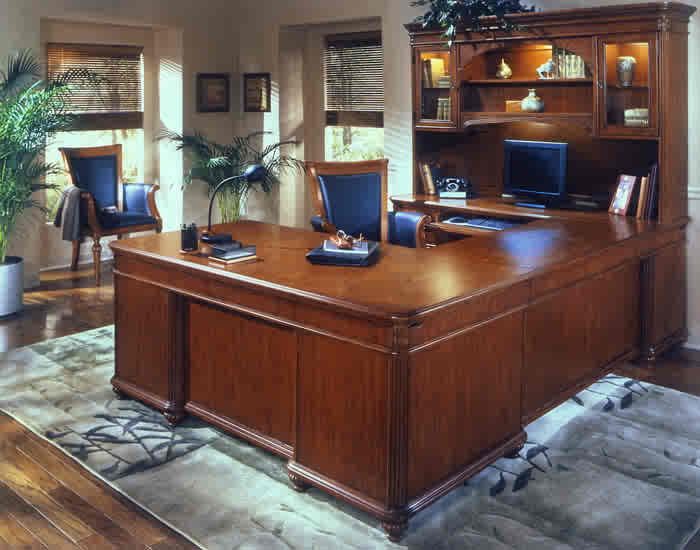 Construction Constructed of selected hardwoods and cherry veneers on wood product. File Drawers File drawers are suspended on metal, ball-bearing, full extension slides. All file drawers lock. File drawers accept letter or legal size hanging folders. Center drawer with wood pencil tray; felt-lined felt-lined box drawer / box drawer with adjustable wood dividers / file drawer per pedestal; Middle box and file drawer lock in each pedestal; all drawers are fully extending. Minor assembly required. Felt-lined center drawer with pencil tray; box drawer with wood dividers / file drawer per pedestal; all drawers are fully extending. Minor assembly required. Center drop-front drawer functions as a lap drawer or a keyboard tray; felt-lined box drawer / box drawer with adjustable wood dividers / file drawer per pedestal; middle box and file drawer lock in each pedestal; all drawers are fully extending. Minor assembly required. Center drop-front keyboard drawer; two felt-lined box drawes; right CPU pedestal features three media storage drawers and a power manager; left pedestal features one adjustable shelf and a pull-out printer shelf. Minor assembly required. 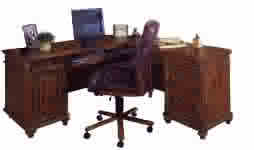 Desk: Drop-front lap / keyboard drawer with finished wood pencil tray; felt-lined box drawer / box drawer with wood dividers / file drawer; middle box and file drawer lock; all drawers are fully extending. 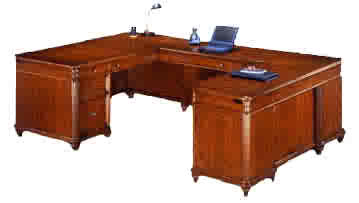 Return: Drop-front / lap keyboard drawer with finished wood pencil tray; felt-lined box drawer / box drawer with adjustable wood dividers / file drawer; middle box and file drawer lock; all drawers are fully extending. Return: drop-front / lap keyboard drawer; felt-lined box drawer / box drawer with adjustable wood dividers / file drawer; middle box and file drawer lock; all drawers are fully extending. Two cabinets, each with an adjustable shelf; divided storage; task lighting; cable access; 19.5" clearence for monitor. Two cabinets with framed beveled glass fronts; each cabinet has a canister light and an adjustable glass shelf; center section has a canister light; one adjustable shelf and one fixed shelf; task lighting. Two fully extending file drawers accommodate letter or legal filing; single side lock; anti-tip device. Deluxe two-tier pull-out keyboard / mouse tray; 32.5 x 18 x 15.5 (25high without shelf) monitor area; Cpu compartment with pull-out CD rack; 19 x 18 x 9.25 (17.5 high without shelf) printer / scanner area; storage cabinet with an adjustable shelf; two box drawers and one file drawer. One file drawer will accommodate letter or legal hanging files; three adjustable shelves; canister light; semi-finished top allows for additional storage.